Long-term success in the roofing industry means staying up-to-date on new building codes, installation processes, and especially new products. After 20 years in the business, Ed Caskey, Sr. at Dixie Roofing Ltd., has discovered that polymer roofing tiles hold a place in his company’s future. “We recently installed our first Bellaforté Slate product on a home in the Houston area with great success,” says Caskey, Sr., owner of Dixie Limited, Inc. out of Conroe, Texas. “Builder George King called us and requested we bid on roofing a new home with a product the homeowner had requested — DaVinci Roofscapes polymer slate roofing tiles. This was our very first time installing the DaVinci product and our team was impressed. 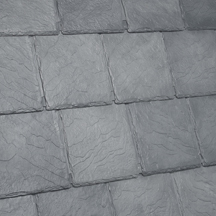 “The ease of installation of the Bellaforté Slate roofing tiles and the overall authentic look of the synthetic slate really made an impression on us. We’ve never worked with this product before, but I can definitely see suggesting it in the future to our other clients. Dixie Roofing Ltd. provides residential roofing services in the greater Houston market. For more details on visit our Bellaforté product website.